The Gamo Whisper Sting is a brand new rifle from Gamos Whisper range that offers superb value for money. The rifle features a black tactical stock which is ideal for use in all weather conditions, and the break barrel action provides high and consistent power output. The rifle also comes complete with a 3-9x40 Scope and mounts as pictured. 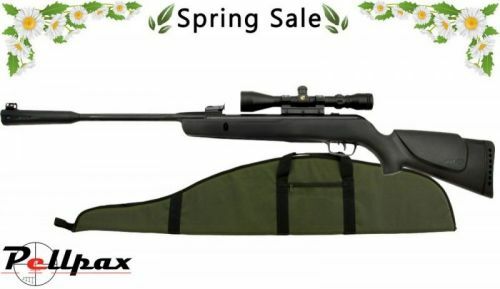 For a limited time only this rifle comes with a FREE padded gunbag. Please note : Scopes may vary subject to available. Sights - Adjustable Rear with fibre optic front sight.